Heat oil in a pan (kadhai). Now fry the boiled eggs till golden from sides (This is the twist to the eggs). Keep aside on a tissue paper, so that the extra oil is absorbed. In the same pan (kadhai), put cumin seeds, cloves, black and green cardamoms. Once the cumin seeds start crackling (in 1-1.5 minutes) put grated garlic and ginger and sauté for a minute. Put ground onion now and sauté for 2-3 minutes. Add salt, turmeric, red chilli, garam masala and coriander powders now and mix well. After half a minute, add ground tomato and slit chillies and cook for 4-5 minutes. Add water now. Once it starts to boil (after about a minute or two) add the finely ground almonds and mix well (This is the twist with the curry). You will notice the gravy starts thickening. In case you like more curry, add about half a cup water at this stage. Cook the entire mixture for 2-3 minutes. Add the fried (boiled) eggs to the curry now and mix well. (You can put the whole egg or you can cut into two and put, I like the whole egg and my better half likes them cut, so I put some whole eggs and some cut ones 🙂 ). Add milk/fresh cream and cook for another minute. Your delicious egg curry is ready. Remove Cinnamon and Cardamoms (if you find them). Garnish with some broken coriander springs. Serve hot with Steamed Rice and Onion Rings on the side. Oh my. Oh my! I’m really really excited to try this sometime! Frying the eggs until they’re browned looks brilliant. What a lovely dish, I love the combination of flavors! 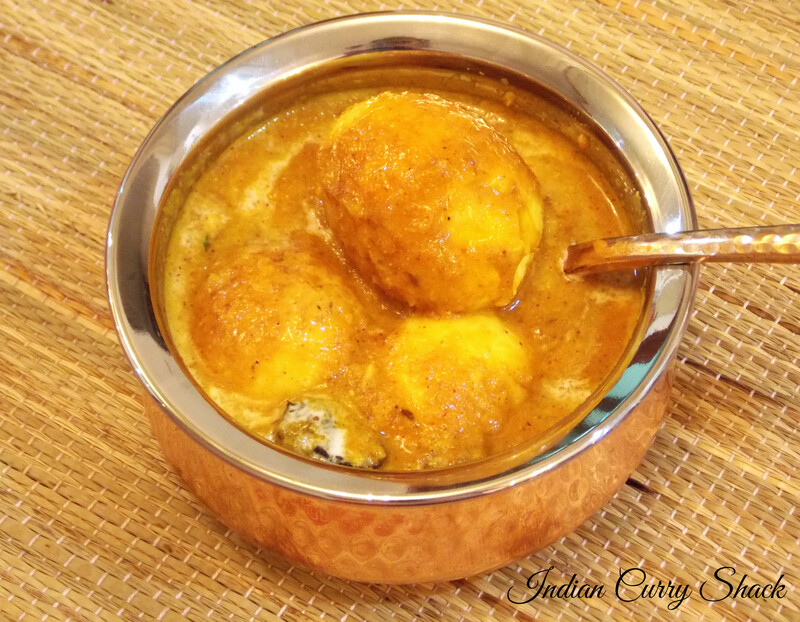 Love egg curry, and yours looks like quite a detailed recipe, will have to give it a try.